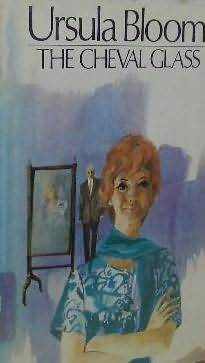 The Cheval Glass by Ursula Bloom was first published in 1973. It isn’t the first book that I’ve read by the author but the ones I have read were much earlier. I really expected to see that this book was one of her last – as it’s shot full of holes. It only has 183 pages and I read it in a couple of sittings and when you do that it’s so noticeable when the same man’s hand is described as being smooth and brown – then later on as being wrinkled, when the author wanted to point out how much older he was than his young love interest. The setting is Norfolk and Hilary is a young artist who is renting the lodge house of a large house called Whitethorn. Her landlord is James, a 60 year old retired army officer, married to Margaret and with a young daughter and two much older sons. In no time flat James and Hilary have embarked on an affair. James is very much attracted to much younger women. When Margaret falls terminally ill Hilary moves into Whitethorn to help look after her. By now she has formed a close relationship with Pearl the young daughter. Pearl is obsessed with a cheval glass which is housed in the attic and talks about the lady in the mirror. This book isn’t well or even carefully written and I hated the fact Margaret is not allowed to know how ill she is, it brought back so many bad memories for me as I experienced that situation while I was helping my mother to nurse my father when he was terminally ill. For me it meant such a waste of precious time – lying about a situation that my father well knew about – but my mother couldn’t cope with. But it’s what some people used to do. As I said previously – I expected this to be one of Ursula Bloom’s last books as it is so carelessly written but according to Wiki she wrote over 500 books in her lifetime under various names – just churning them out, so it is no surprise that it’s so badly written. According to the Fantastic Fiction link at the beginning of this post she wrote fourteen other books in 1973. Quantity over quality obviously! Did she write them, or was it some sort of franchise deal? -As often happens in publishing. Ursula Bloom (1892 – 1984) aka Sheila Burns, Mary Essex, Rachel Harvey, Deborah Mann, Lozania Prole. 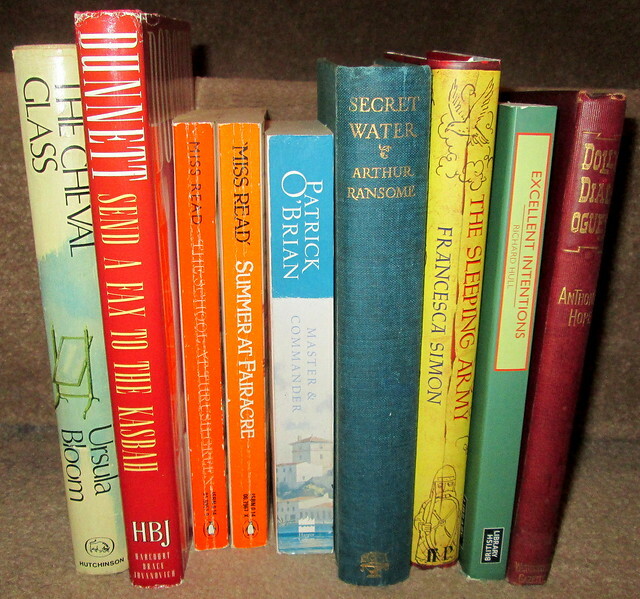 Nine more books entered my house the other day. I say that as if they did it of their own volition, bursting in the front door like gatecrashers, but I must admit that it’s entirely my fault that my TBR piles continue to multiply. A visit to Edinburgh’s Stockbridge area usually leads to me buying more books although my pre-Christmas visit was disappointing, if I’m remembering correctly. I made up for that this time. It’s quite a mixture. I had thought that Dorothy Dunnett had only written historical fiction but Send a Fax to the Kasbah was contemporary in its day. The blurb on this book says: This highly pertinent look at the world of big business in the last decade of the twentieth century presents Dorothy Dunnett at the very top of her form. Mind you, as it was first published in 1991 and uses the word ‘fax’ in the title it will probably seem quite historical now. To me Anthony Hope was the author of The Prisoner of Zenda and I had never heard of Dolly Dialogues but it seems that it’s an amusing read – so I could use it to count towards the humorous classic in the Back to the Classics Challenge. I bought this one for £2 but people are asking silly prices for it on the internet. I always buy British Library Crime Classics when I see them in secondhand bookshops, sometimes the cover is the most impressive thing about the books. So far the mysteries have only been about 50% good and I’m left thinking that there must be better crime classics which are more deserving of being reprinted. I think that Excellent Intentions will be a good one though. Master and Commander is the first in a series of books by Patrick O’Brian. I believe they feature the ship HMS Surprise, that’s mainly why I want to read the series as one of my ancestors was transported to Australia for sedition (it was a fit up! ), and I just recently discovered that he was transported there on The Surprise. Have you read any of these ones? The Hunter’s Moon by Ursula Bloom was published in 1969, my copy is a Romance Book Club edition. I must say that I do like the book cover. The setting is 1951 and Diana is a young woman who has been brought up by very old-fashioned parents. Her father is a miserable man, a bit of a bully and his wife is afraid of him. Diane’s boyfriend John is ex-RAF, a World War 2 pilot who is having a hard time settling down to the mundanity of civilian life, working in a London office, poorly paid and bored stiff. Anyway Diana realises that she would rather go it alone than marry a man that she doesn’t love anymore. John finds it difficult to accept her decision. Although this book was published by the Romance Book Club, for me it was less predictable than most romances and considering the time it was written and published it has very modern and dare I say it feminist outlook. I would have liked to have been able to give this one a 3.5 on Goodreads, I didn’t love it but I did enjoy it and the armchair travelling to the south of France involved. I was asked by the publishers if I would like to review Wonder Cruise by Ursula Bloom, apparently because I’ve reviewed some D.E. Stevenson books in the past. I jumped at the chance because I had read and reviewed an old copy of Mrs Bunthorpe’s Respects by Ursula Bloom. I like her writing, it’s funny but also well observed. She was very prolific, apparently writing over 500 books under various names, she was 92 when she died and she started writing at a very early age. I was a bit put off by the title. Wonder Cruise sounds a bit tacky to me and Mills and Boonish and when I saw the book cover it didn’t make me feel any better. But I did really enjoy the book which was first published in 1934. Ann Clements is a 35 year old spinster, she was brought up in a country rectory, a very sheltered and quite boring life, her mother died when Ann was only eleven so Ann had taken over many of a vicar’s wife’s duties. Her brother is an evangelical vicar, he’s married with one daughter Gloria, Ann’s goddaughter and they live in London. When her father dies Ann realises that she has to find a way of supporting herself, the proceeds of the sale of the rectory furniture allow her to take a secretarial course. So for the past nine years she has been working in a London office, again her life is boring, hand to mouth and predictable. Then an amazing thing happens, she wins £350 in a sweepstake. What should she do with it? Invest it at 3% bringing in a teeny amount of money a year – or splurge it on a Mediterranean cruise? Her brother is outraged by the whole thing, she shouldn’t have been gambling and she shouldn’t think of using the money for herself, he wants her to invest it for his daughter’s future. Sensibly Ann chooses the cruise which of course leads to a complete change in her life. This is one of those wish fulfilment books, the sort of thing that legions of women must have hoped would happen to them and if it doesn’t happen then reading about it is the next best thing. A witty heartwarming read with great romantic and comic characters. This warm feel-good tale will make you smile, and you’ll be rooting for Ann to find lasting love and happiness. But for fans of vintage fiction it’s more than that. It’s a real trip back to 1934, the attitudes, clothes and the amazing things that happen when you get your hair shingled. In fact I almost felt like getting my own hair shingled, but as I have never met a hairdresser yet who does what I ask them to do I thought better of it! Why do publishers rarely get the covers of books correct? This one would have been so much more attractive if they had gone down the same road that the British Crime Classics have. Art Deco/1930s clothing, buildings or even a 1930s ship would have been so much better than the soppy effort they chose. That aside, my thanks go to Corazon Books for giving me the opportunity to read Wonder Cruise – a good read. I bought this book fairly recently, a signed copy in fact. I knew that I had heard of Ursula Bloom before. I thought I had read some of her books back in the year dot but I now think I was wrong about that. This is an autobiographical account of all the servants which the author had in her life, starting just after she got married when she had to get her first lady’s maid. Apparently married ladies of her class weren’t able to get dressed on their own. It wasn’t something that she wanted, she was appalled at the thought of having to undress in front of a stranger, but Ursula’s rather superior and snooty mother-in-law was aghast at the thought of her not having a maid, what would people say about it?! – so she had to have one. The author seems to have got into the swing of things quite quickly though and as it was 1916 when she married for the first time there wasn’t much of a servant problem but she could see that the times would change, and of course there was then the perennial moaning about servants. It’s amusing although I’m not sure that the author would have expected me to be amused at some bits of it. At one point she explains to a servant that she couldn’t possibly employ her if she expected wages of £30 a year. In the next sentence she swans out and drives off in her Lagonda!! This book was published in 1963, when you think about it the changes that someone like Bloom experienced in her domestic life would have been enormous, but she wrote over 500 books under various names. Could we all do that if we had servants? !